A [Watchkeeper] drone launched from West Wales Airport at Aberporth crashed in a lane close to the airstrip at around 5pm yesterday afternoon. Police and firefighters were called to the scene near Cyttir Mawr farmhouse after the pilotless plane - also known as a UAV – apparently came down in some trees. No-one was injured but a Mid & West Wales Fire and Rescue Service spokesperson said one crew used foam to clean up the resulting fuel spill. All enquiries to the airport were being directed to the MoD press office this morning. Click here for the full story, on the Cambrian News website. (EDITOR’S NOTE: The Watchkeeper programme was originally contracted for £800 million by the British Army, but delays and overruns have boosted its cost to over £1,200 million. In exchange, the British Army obtained 54 Watchkeeper aircraft, several of which were rushed to Afghanistan so they could fly some token missions before the British Army pulled of the country. They have since been mostly operating on training missions, with regular crashes diminishing their number: five having been lost to date. 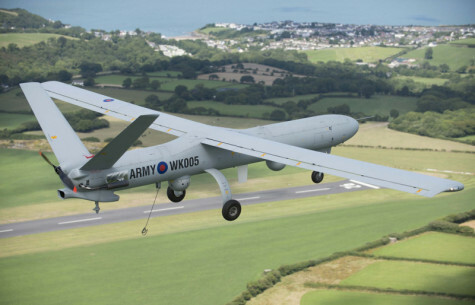 Two multi-million-pound British Army drones crashed into the Irish Sea after taking off from Aberporth earlier this year, the Ministry of Defence has confirmed. The loss of the unmanned Watchkeeper aircraft led to the temporary grounding of the entire fleet, it emerged last week, with flight trials only resuming in early July. The crashes – coming three years after a multi-million-pound drone had to be scrapped after crashing on the Aberporth airfield - are the latest in a series of accidents and delays to have hit the Army’s new spy planes. The MoD ordered 54 Watchkeepers in 2005 as part of an £847m deal. Originally, it was hoped they would be in service by 2010. Click here for the full story, on the South Ceredigion Reporter website.